will my plants have enough room? any modifications you think i should make? Hi Corup, Welcome to the Forum from California! Trolleydriver, a very active active Ontarion, is on bereavement leave from the Forum, but will be back very soon. Ontario is becoming an active All New SFG area. Regarding zucchini, they are bed hogs, taking up about 9 square feet each. A compromise is to build a row of 2' x 2' boxes, or even 18" x 18", for each one. Welcome from Ohio, c0ryp1! How much room are you giving those zukes? Also cannot see your links, can you just describe your set up? How many squares, what you like to grow, etc.! I can see the links, but the photo images are too small to read. One magnifying glass icon leads to search, the other is view image... and neither *magnifies*....? Can you tell I'm not familiar with photobucket? I tried to copy and paste the image into MSWord and then enlarge it, but the words were all fuzzy and I still couldn't read them. 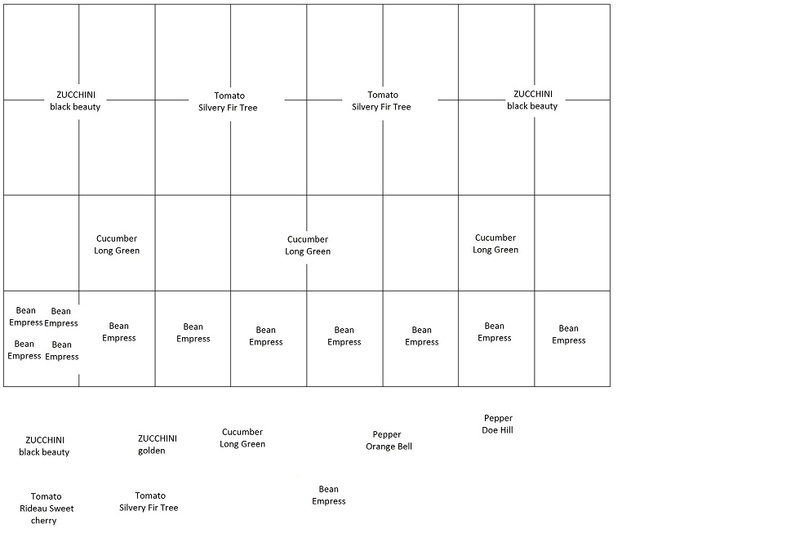 Was planning on starting my seeds at 2 week intervals to see if I can get some ripening at different times but I also was reading that all of the items I have chosen produce like crazy so this may not be needed? You got a plan! Sounds good! You have gardenend before, right? So you know what you like to eat, or is this a newish adventure for y'all? So last year, 2nd year, I ended up more on target. However, I realized that a lot of what I like to grow in summer requires COOKING. And I abhor cooking indoors in the summer. It does not happen. THerefore, this year, I am focusing more on stuff that I can eat right off the vine. 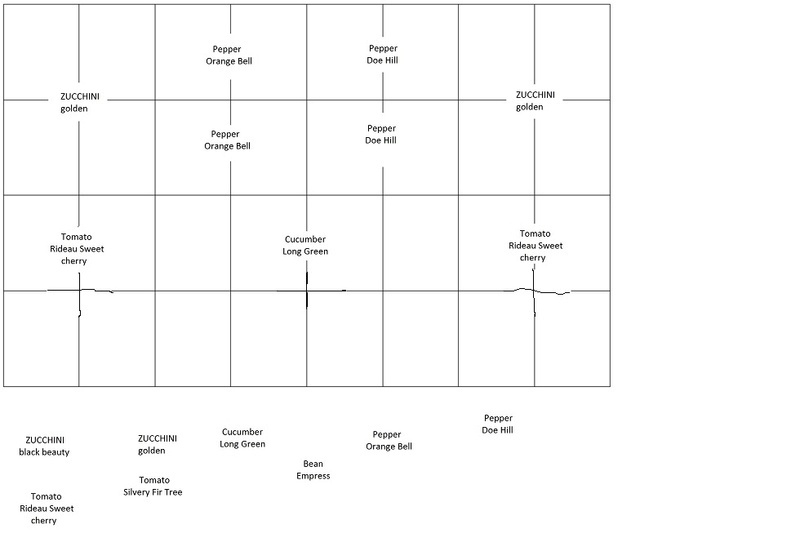 Cory, Peppers can be planted 1/sq with SFG. Regarding the Zucchini, you will be trying to pawn off surplus to neighbors, strangers and any car with an open window! Do you have a Seal-a-Meal? You can blanch and freeze them for winter enjoyment. Hi Cory. Welcome from Atlanta, GA. Sounds good. And I'm sorry you don't have room for blueberries... We use them as our front hedges. From 6 plants last year, we got about 6 gallons (using bird netting). Oh, and you can also dehydrate them! Come and see us on the Canadian thread when you get time, but keep this thread as your own, then you can keep in place a diary of your progress and you will appreciate it as the years go by. Trolley Driver is from Ottawa and he has his own thread. I wish I had started one of my own when I joined SFG. Although Canada is a large land-mass, we seem to have few gardeners compared to the U.S. but that is understandable as their seasons are so much longer. But we do our best. We often complain about the cold and the wet etc. Looks pretty good! Others have made most of the same comments I would have. Hi Cory, I am in Ontario too. Started my pepper and Tom seedlings last weekend. I think I started a bit earlier last year, but my plants got too big. They did fine though (I buried the Toms in deep). I water my seedlings from the bottom in big trays, and put them in a warm area. I bought a little mini greenhouse, where I hung lights with plastic cables. To save money on electricity I put the lights on at night. I also put blocks under the pots to raise them as close as possible to the light. There are different tricks for doing this. The seedlings also like air circulation so they don't dampen off, and to get stronger. I use a small fan to get them moving a bit. I also use organic fertilizer when they're a couple of weeks old. Otherwise, just follow the instructions on the packet. Good luck with you plant babies. I find growing from seed very fun and empowering. You can get way more kinds of plants this way too. Plus they're charging too much for seedlings these days. @Mimi2 wrote: Hi Cory, I am in Ontario too. Started my pepper and Tom seedlings last weekend. . . just follow the instructions on the packet. Good luck with your plant babies. I find growing from seed very fun and empowering. You can get way more kinds of plants this way too. Plus they're charging too much for seedlings these days. Stake secured to the side of the beds, then secure the cages to the stakes.